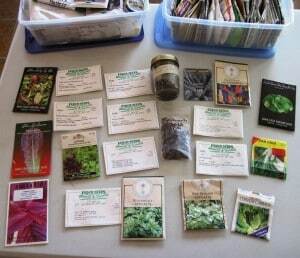 Alas, my ground outside is still very much covered with snow and ice, and here I am ogling greens seeds old and new. 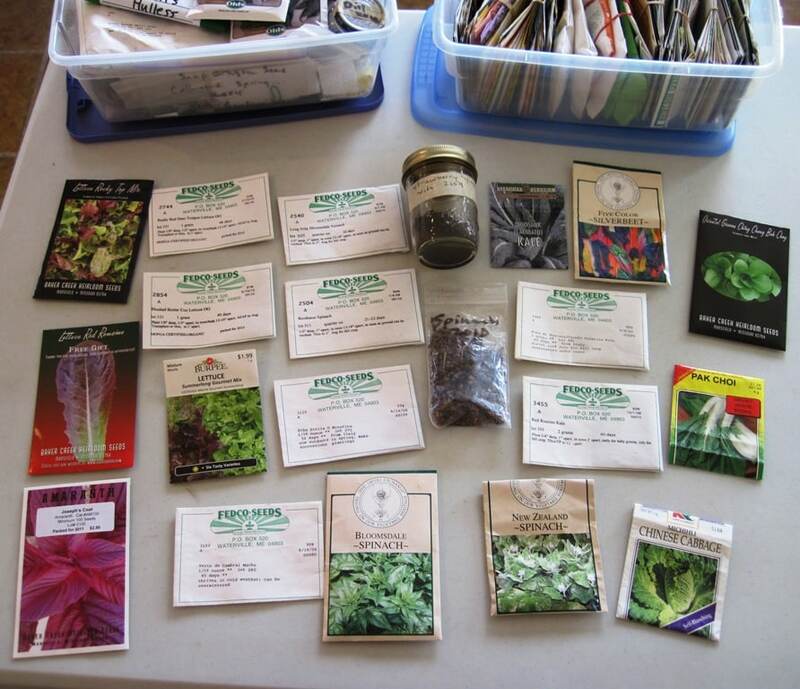 I love the variety you can find by shopping through seed catalogs. To get a jump on the season, I've got an indoor planting bench and a small greenhouse attached to the house. 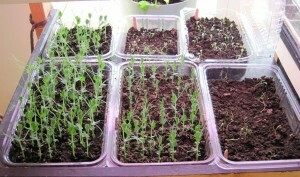 This year, I decided to try something different and pre-sprouted and grew out some pea seeds just for use as greens. The tender tops and little tendrils make a nice salad addition. As you can see, the peas have developed nice little root systems. Some of them haven't sprouted, so those get tossed. I put some potting soil in old organic salad mix trays, snuggled the little seedlings in and tucked them under the grow lights. At the same time, I started some Rocky Top lettuce mix, some butter Cos, some spinach, some Alyssum and some Painted Tongue. Two days later, and the peas were coming along nicely. 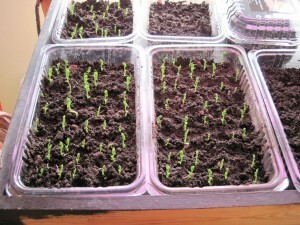 A week later, and the first pea tops were ready to harvest. The salad greens and flowers were poking up out of the soil. As I said, it's been really cold and dreary here, so I'm setting no records for rampant growth. I moved all of these trays out to the greenhouse shortly after this photo, and they've really been creeping along. Here's my first bowl of pea tops. I added them to a nice mixed salad with some organic store bought greens (a month later, and the lettuce and spinach are almost ready to harvest as micro greens – trying to be patient). 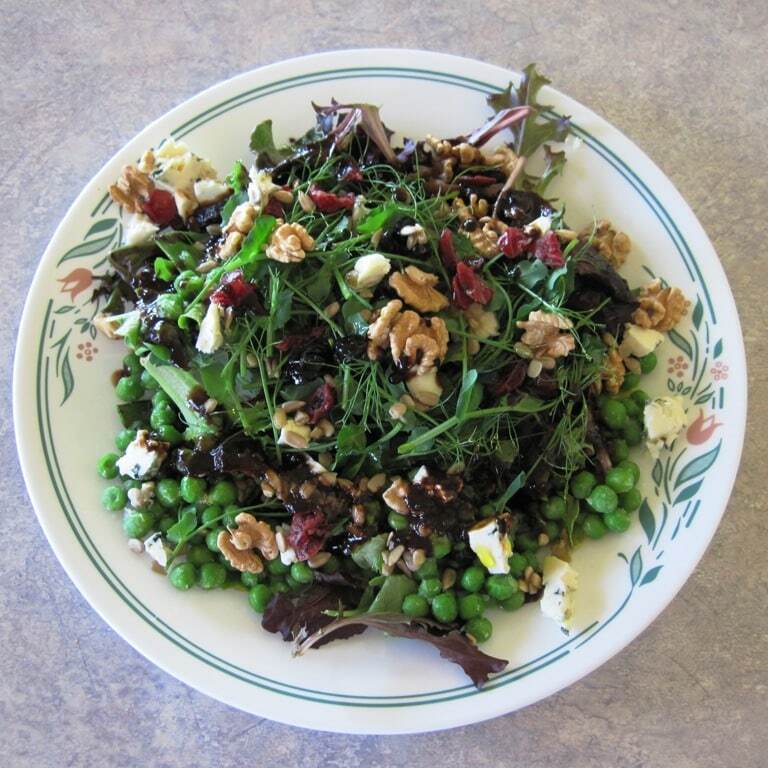 Here we've got some leftover shell peas from supper the previous night, greens, pea tops, crispy walnuts, raw milk bleu cheese from Nala's, soaked sunflower seeds, dried cranberries, dried blueberries, balsamic vinegar and flaxseed oil. I regularly enjoy having a big mess o' salad like this for lunch. Sometimes I'll add sardines or pickled fish, or fresh sourdough bread slathered with plenty of butter. Temps are finally warming up this week, so I'll be starting more seeds inside and hopefully be able to plant outside within the next few weeks. 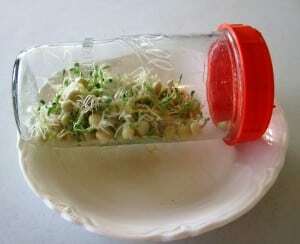 I decided I'm going to use my sprouting jar to pre-sprout my early peas before plating them out in the garden (these really early ones will remain inside for greens) , since I regularly have germination issues with peas when the ground is cold and wet. I've got some worm castings from Whitetail Organics to top dress the soil, which adds a nice little nitrogen boost that leafy veggies love (I also add it to my potting mix). The worm castings don't have the potential disease issues of improperly finished compost or pathogen potential of other manures, which is another reason I like to use vermicompost if I have it. Most greens do well in (or prefer) cooler weather, so they are great season extenders. What are your favorite greens? Do you have any tips for growing them that you'd like to share? UPDATE: The snow has finally cleared from the garden, and I can see the semi-permanent greens bed that had just started leafing out last fall coming to life. I've been letting this corner of my garden self-seed with mache and strawberry spinach. Last fall it was getting quite overgrown with inedible weeds (the dandelions went in the salad bowl, too), so I cleaned it and added spinach. The little plants are about an inch tall. Yeah! That salad looks divine. 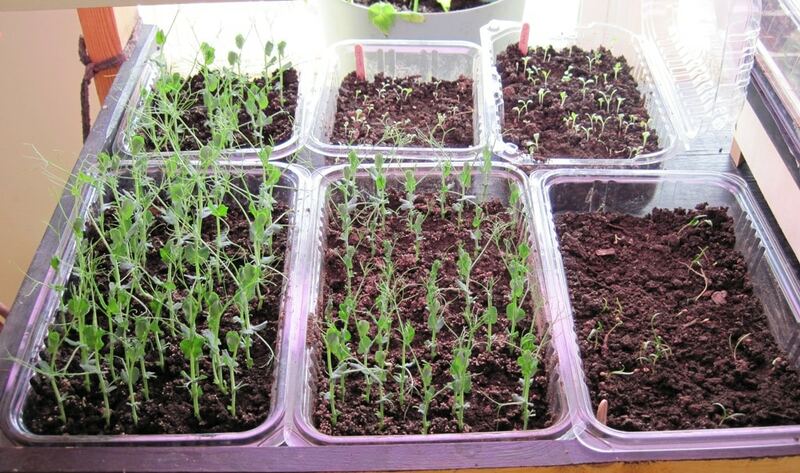 I love the idea of sprouting peas indoors for salads! Thanks for linking up with Simple Lives each week. Awk. I haven't started anything yet! I'm going to use your method for my peas. Thanks. Thanks for taking the time to stop by, Annette. I know you're really busy right now. I always enjoy simple Lives Thursday. would this same method (sprouting) work for peppers? "STARTING THE SEEDS: First I presoak my seeds. 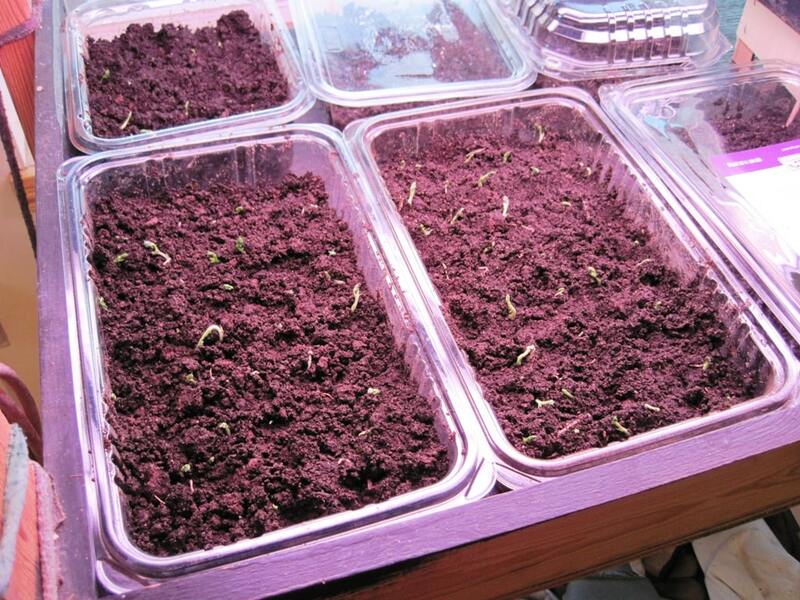 Tomato and Pepper seeds are soaked 6 hours, no more that because they can suffocate from lack of air. I soak my Pea and Bean seeds overnight. Then I always place my tomatoes, peppers, peas, and other seeds in slightly moist paper towels, placed in ziplock baggies and placed in a WARM safe place. 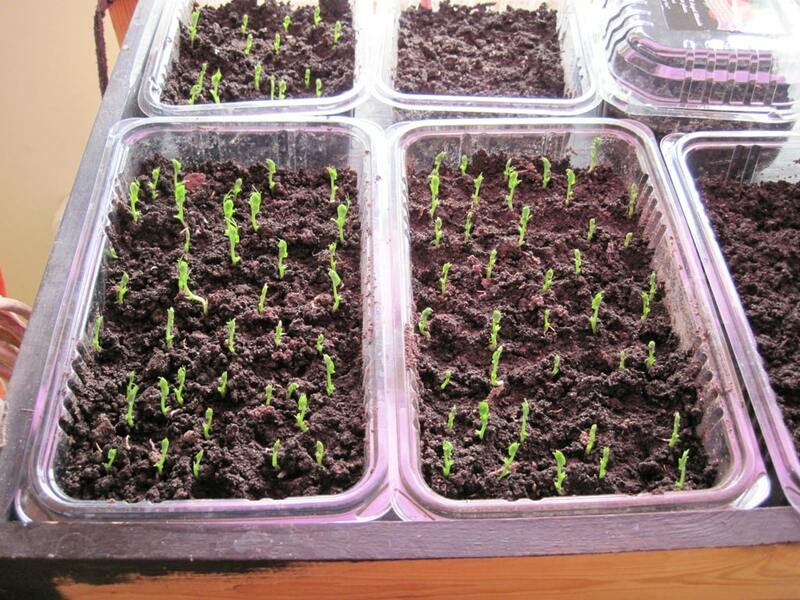 I check them twice a day and when they germinate, I pop them into the potting soil mixture in the egg trays. Tomatoes and Peppers are tropical plants and need a constant heat of at least 80 90 degrees to germinate. This means that a heating pad is fairly useless if your room temperature is 55 degrees, because the minute that seed reaches the room air, it will not survive. Tropical plants must have a constant heat 24 hours a day. To be repetitive that means that you cannot let the room temperature fall each night and not expect it to affect the germination rate of the seeds. I grow very rare seeds and it is worth the trouble to do it correctly the first time. .
Tomato and Pepper seeds are planted just deep enough to cover them. 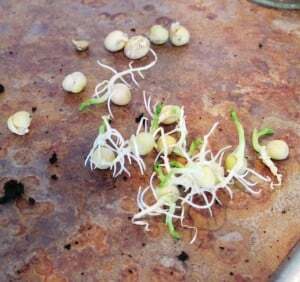 If you plant them too deep they cannot make it to the soil surface before they run out of the stored energy in the seed. I put water ONLY in the bottom tray because if the soil needs the water it will soak it up. This keeps the top of the soil dry and retards damping off. Damping off is caused by a fungus that thrive in cool, wet conditions. So do NOT mist the tops or water the tops of the seed trays. The seedlings will sprout in no time because the heated room, (I use a walk-in closet) and the shop lights create a heat inside the plastic bags. I also plug all the shoplights into one multiplug thing and plug this into a timer. Within one or two days of sprouting, I remove the bread bags and make sure that the lights are as close as possible to the tomato leaves without actually touching them. From then on, you make sure that the tray bottoms always have some water in the bottom. 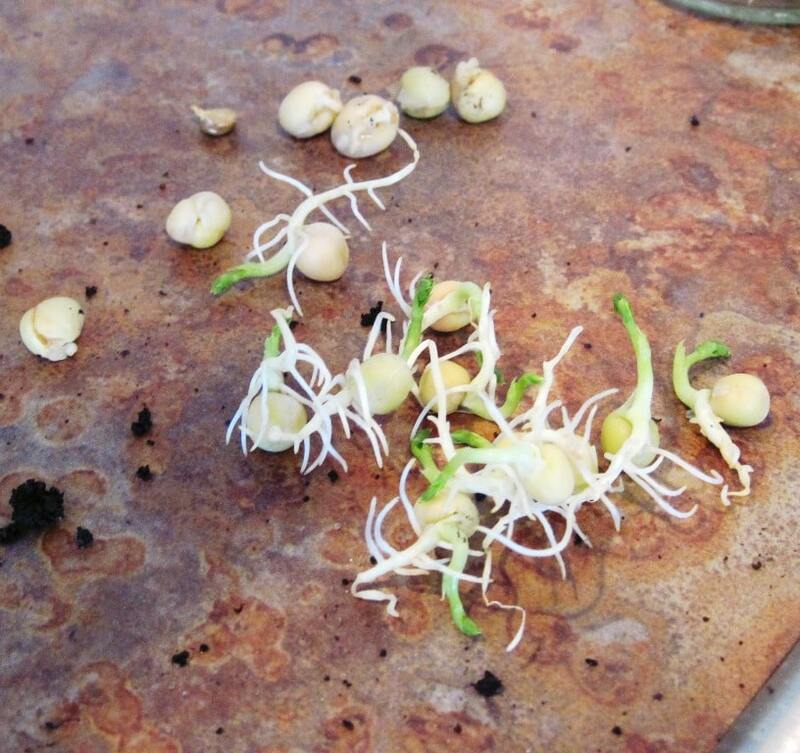 If a seedling looks sick, remove it immediately, and wash your hands. Damping off is a fungi and does NOT have to spread, although it can." Beautiful! 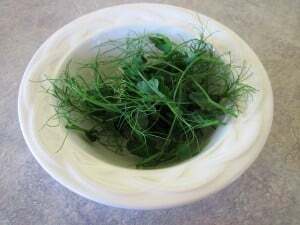 My fav salad green is Wrinkled Crinkled Curly Cress. Peppery and lovely. I simply CANT WAIT until I am eating spring salads. Thanks very much!! I have read the link you posted (coffee filters/baggies) I guess I will try it that way!! Lara – what does cress taste like? That's one I haven't tried. Helen – good luck! My tomato seedlings are doing well, but my peppers are slow to put in an appearance this year. Thanks for the sprouting tips, I can't wait for fresh summer pickin! Hi Allison! Thanks for stopping in and taking the time to leave a comment. I'll be "swinging by your place" soon. 🙂 I'm so excited about getting out in the garden again, even though right now it's very wet. I miss your fun garden! Ours is still squirting when we step even on the grass borders. Can I just say we've had more than our usual rain 🙁 Anyway, what has kept me hopeful that the garden will survive, is the glorious KALE that carried us through the winter! Winterbor, Lancinato, and Peacock. Still goin' strong. I have baby stir fry greens and several kinds of lettuces thriving in a raised, covered bed. Planning on transplanting every-other-one to sideyard flower beds as soon as we get a weather break. I'm about ready to sacrifice to the Rain God, I'm tellin' ya! 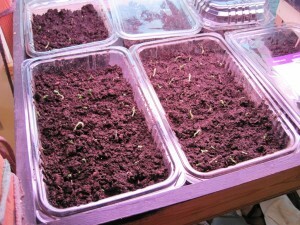 Your help with the tomato & peppers worked great; tomatoes are in the dirt now, peppers getting close. So now I'm wondering about other seeds (lots)!! Can you use the above jar method you used with the peas on pretty much everything else or do some things do better with the napkin/filter method like the tomatoes & peppers do? Helen – Rule of thumb – I'd say large seeds (like peas and beans) could be germinated using the jar method. Small seeds I'd recommend the filter method. Pumpkins and other vine crops I'd probably just do a 2-3 hours soak in warm water to soften the hull, then plant in dirt in small pots (before waiting for the sprout to appear), but you could also use the filter method. I start them (vine crops) inside around 3 weeks before average frost free date. Then tend to have less transplant shock if transplanted when they are relatively small. I usually don't bother to pre-germinate before planting, unless I anticipate low germination rates for some reason (old seed, cold ground, etc.). Thanks again Laurie!! Normally I would start everything in dirt; but this year winter just keeps coming back and I'm getting antsy!! I wanted to see something sprout!! lol – I know what you mean! I went and checked the garden this week to see if the greens I had planted last fall had overwintered, and sure enough, there in the snow, were little green leaves of mache and spinach. They were flat, but alive. I'm hoping that when/if the warmer weather kicks in they will take right off. I've been munching on the greenhouse greens, but I need larger quantities!